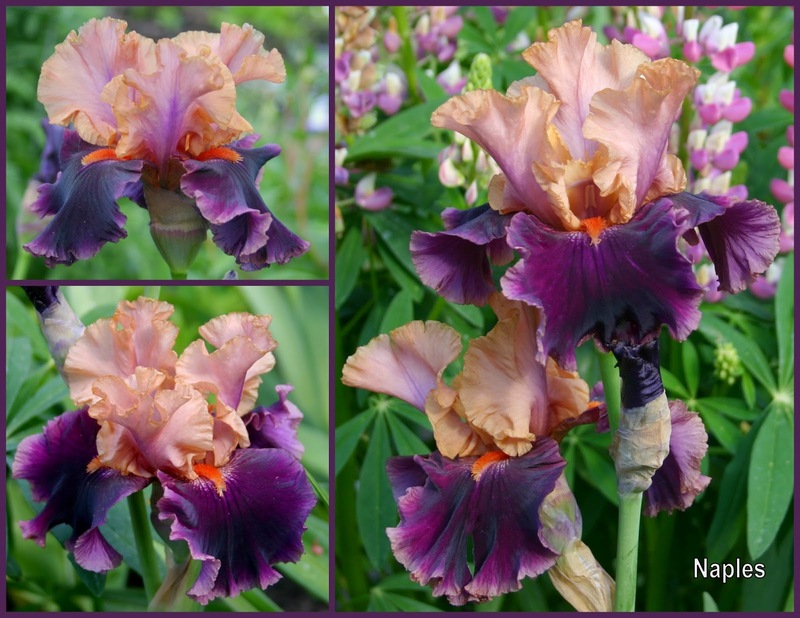 A few readers have messaged me recently asking about the collages I make of the tall bearded irises I use for my personal use as well as the AIS World of Irises articles I've written. I appreciate your comments, questions, and suggestions. With the onset of the iris season, now is a good time to get our iris maps, pictures and files organized. Wayne writes that "he would be interested in knowing more about how I create the collages and [my] visual "wish list." He goes on to ask what "thought process, tools and workflow" I use and says that "the collages really help" him. Probably many of you do this already. I use a program called Picasa that was free with my computer. It allows me to create a collage. I'm sure there are many programs that do the same thing. To create the collage, I first select the iris picture I want. I crop it, then save it in the picture bar until I have the number of pictures I want. 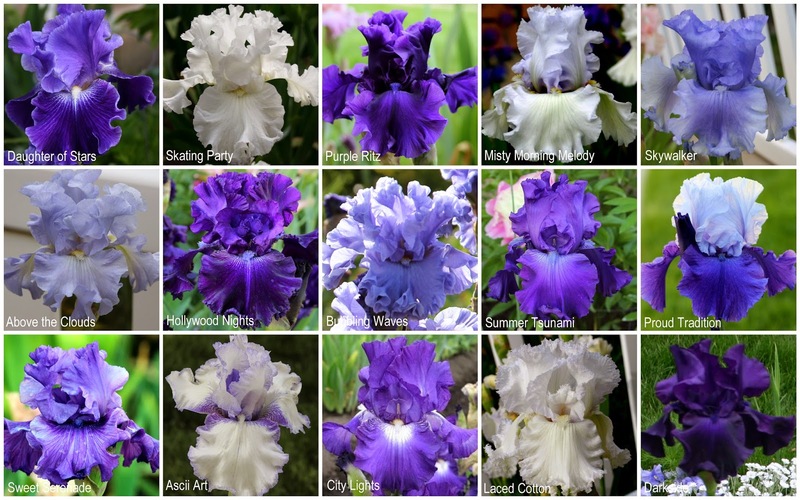 For the large collages, I usually select 15 irises, although sometimes I choose more. 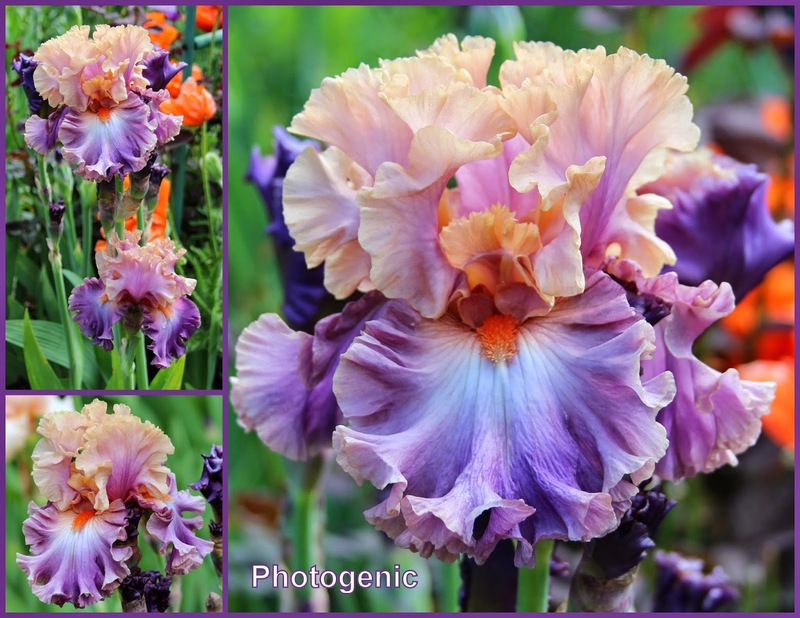 For the single iris collages, I use three shots of the iris, usually front, side and a stem shot. The rest is easy--just select "create" and the collage magically appears--I love technology! To arrange in a different order there is a shuffle option, or you can click and drag to the desired placement. Text and section dividers can also be added in fonts and colors of your choice. 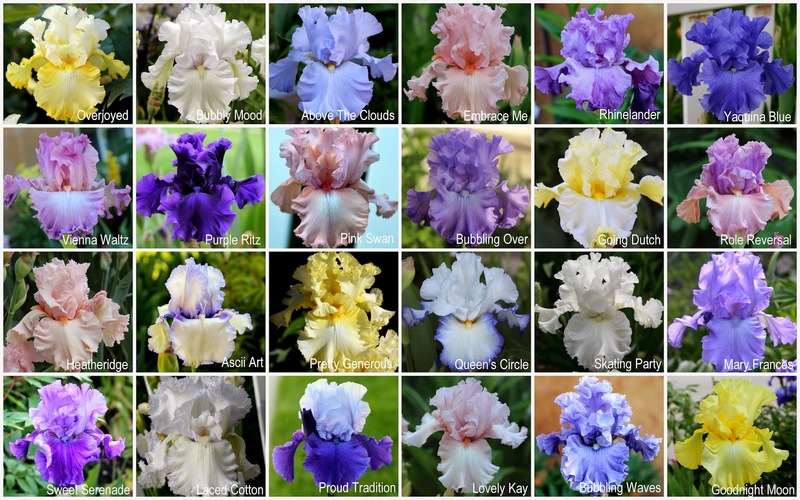 My visual "wish list" is made by copying images taken by fellow iris lovers of beautiful irises they've grown and shared on the "Iris Lovers" Facebook page. I have a folder on my computer that I save those images in. I tag them with the name of the iris, the hybridizer, the person who took the picture and any other pertinent information, such as where I can purchase them, etc. At last count, I had 454 irises on the list! I know I can't possibly get them all, but it makes for some enjoyable viewing as I can then watch them as a slide show. Another reader, Rebecca, is planning a blue monochromatic bed and saw a recent AIS World of Irises article (click blue monochromatic to view article) that discussed that topic. She wrote and asked if I could label all the irises in the collages. 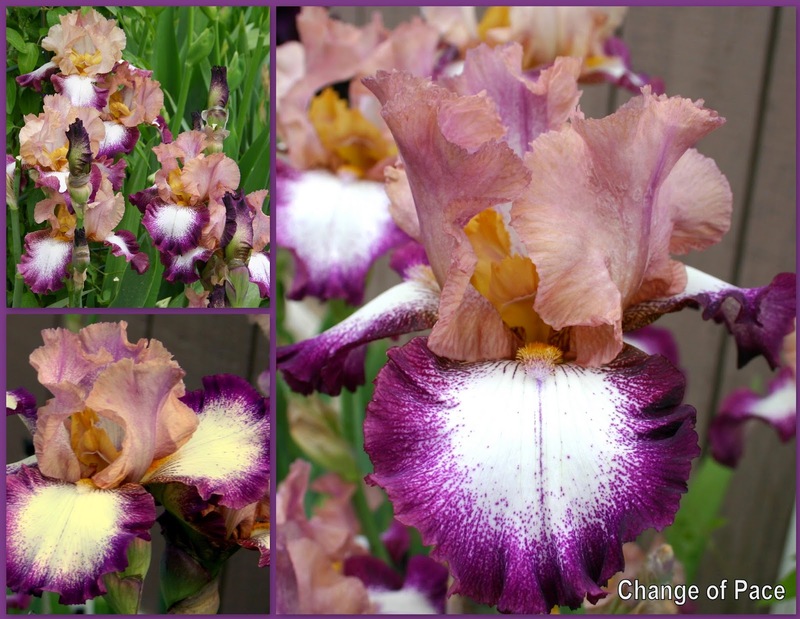 It was simple to go back in the folder and edit the collage, adding the names of each iris. 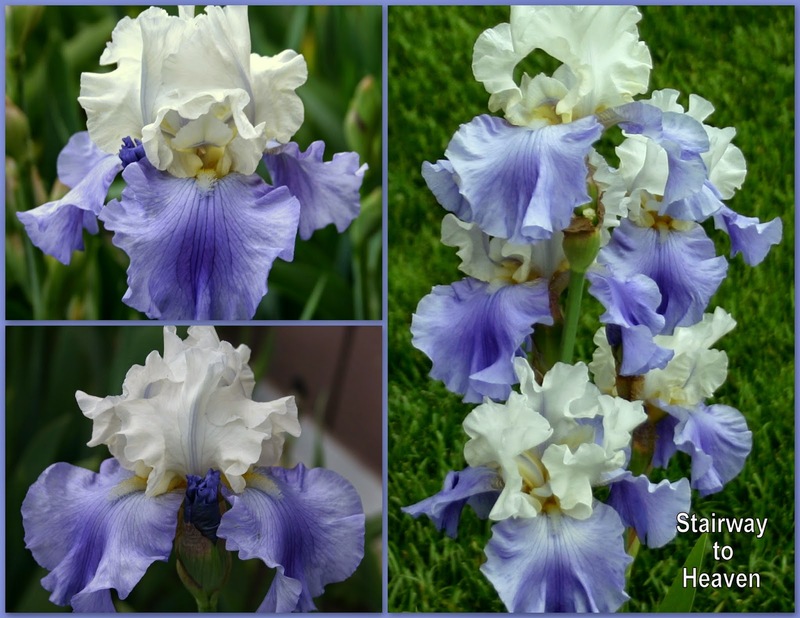 I was then able to send her 5 or 6 collages of the blue irises grown in my garden. Like I said, I love technology! 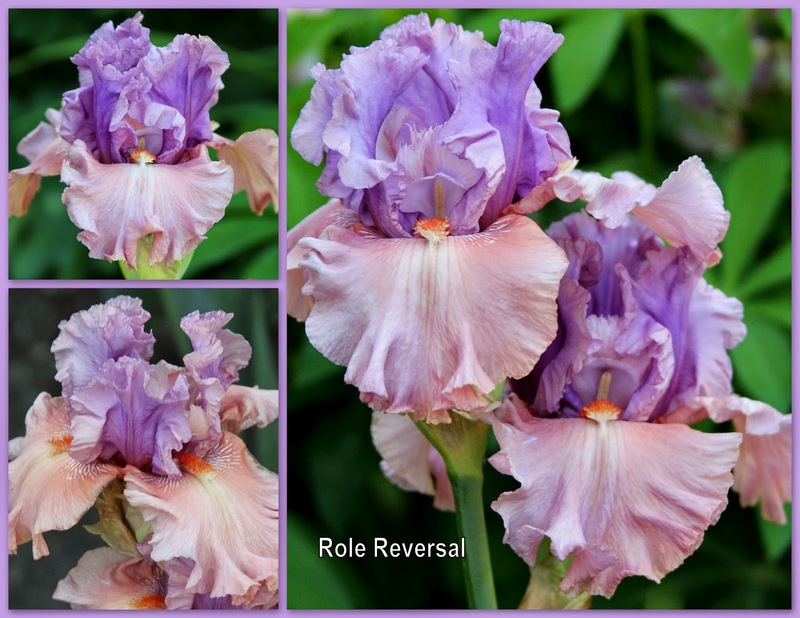 To organize irises for use in identification, color coordinating beds, purchasing new ones, or just keeping track of what you've got, the collage system has worked well for me, and it may for you. It's fairly quick and very easy to do. 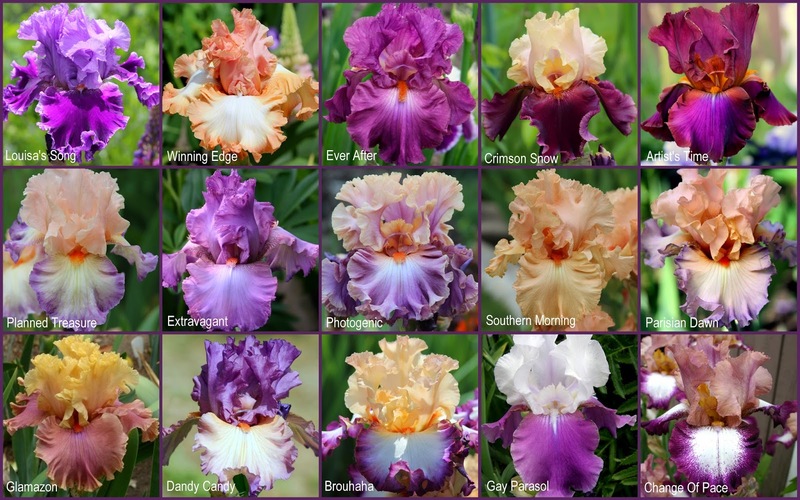 Having a visual of each of my iris beds, as well as a collage of each individual iris is what has worked best for me. I hope this article has helped anyone having similar questions. If you have a great way to keep a visual record of your irises that works for you, I'd love to hear from you! I love reading your comments. Bigger is better? Fatter flowers are superior to skinny ones? Not necessarily when it comes to Louisiana irises, at least not officially, and not in the view of many devotees of these plants. 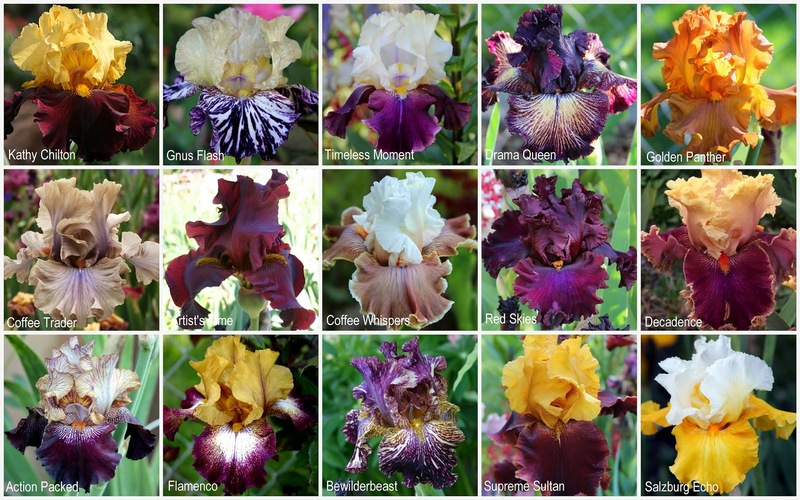 Wisely, the AIS Handbook for Judges asserts that none of the recognized flower forms among Louisiana irises are unacceptable and none are superior to the others. We are allowed to have personal favorites, of course. 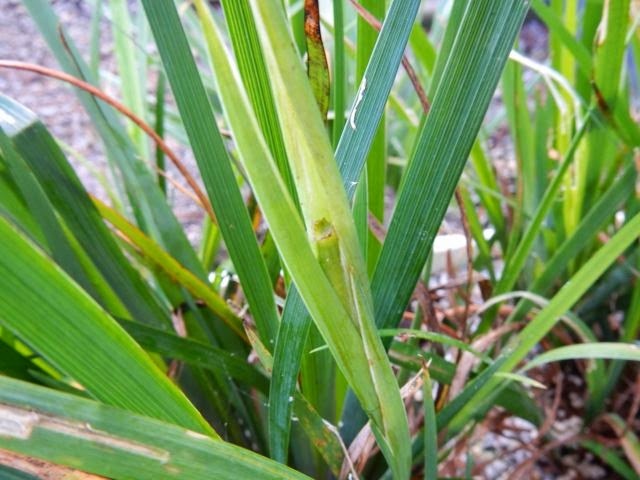 Ron Killingsworth’s excellent blog post in November 2012 covered the wide range of forms found among Louisiana irises. 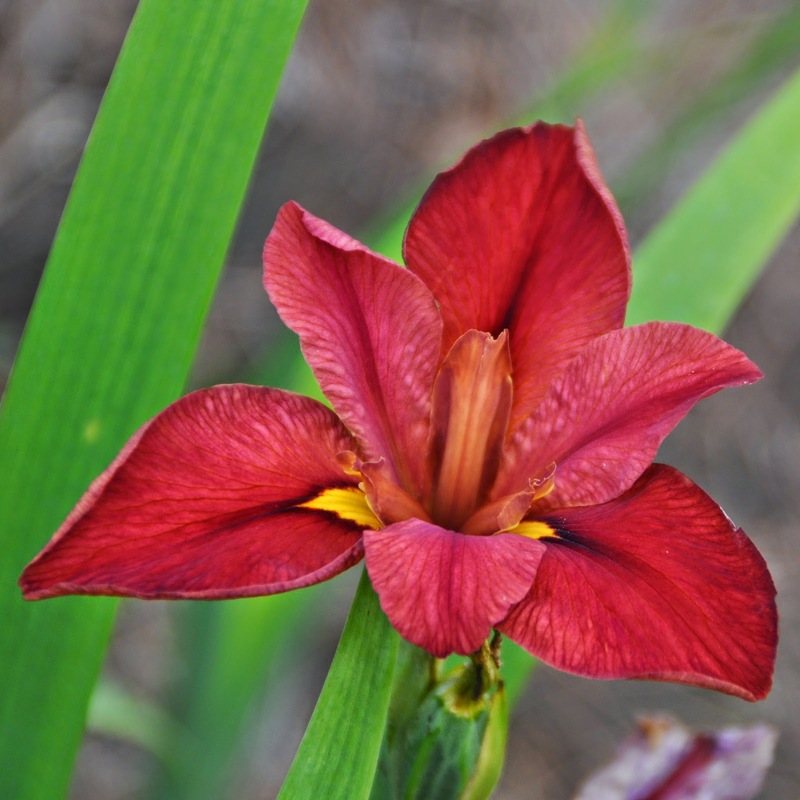 If one looks at the latest introductions, it might appear that hybridizers have mostly abandoned anything reminiscent of the open form characteristic of the five Louisiana species and the many natural hybrids found in the wild. Ron gave them their due, but I want to double down on the virtues of these flowers and argue that modern hybridizers should rediscover their merits. 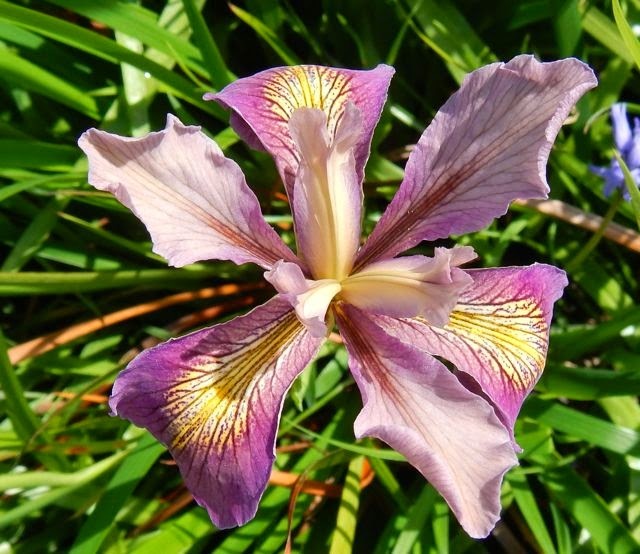 All of the five species of Louisiana iris have an open form and each makes its contribution. We can thank I. fulva and I. nelsonii for red and yellow. Fulva usually has drooping petals that are rarely a model for flower form, although if not taken to an extreme, an umbrella of color can be quite pretty. The flower of Iris giganticaerulea is most appealing to me. It flares elegantly upon opening, with its petals pointing both laterally and skyward, creating an airy, graceful shape. 'Black Widow' (MacMillan, 1953). A classic and still popular Louisiana iris exhibiting an open form. Photo by Linda Trahan. 'Dixie Deb' (Chowning, 1950). Another old and open Louisiana cultivar. Also a vigorous grower and a good garden iris. 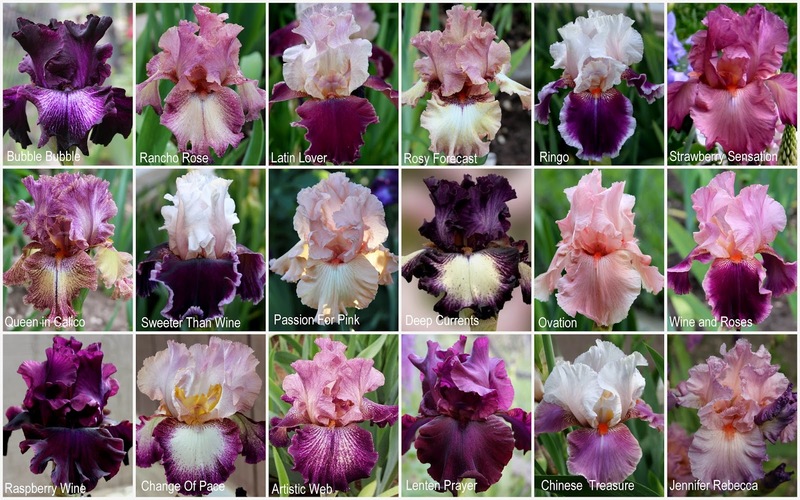 In sifting through iris pictures in search of good examples of open, flaring cultivars, it is striking the extent to which they are mostly old and not far removed from the stock found in the wild in Louisiana. 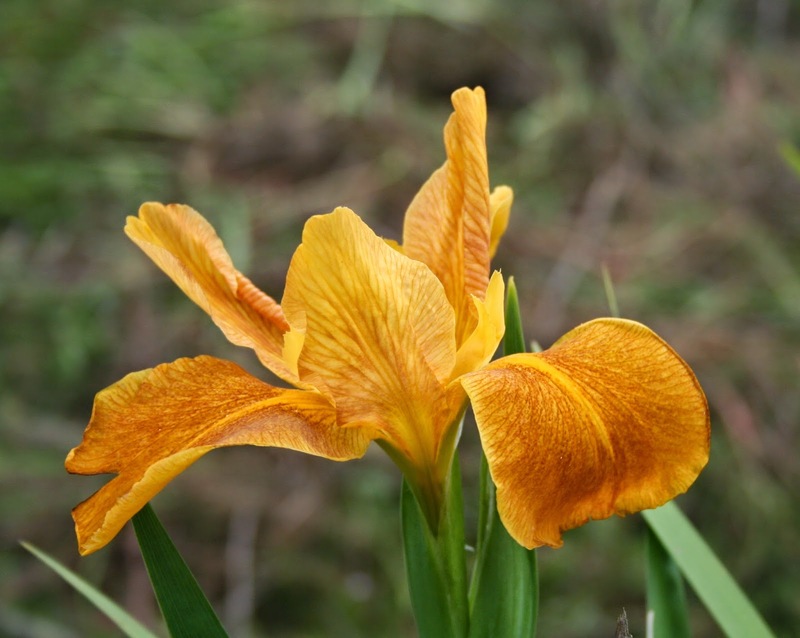 To the extent that newer introductions of this type exist, they tend to come from hybridizers in Louisiana where the reminders of the irises’ natural history are still vividly in evidence along the roadways and in the wetlands. Sometimes, admittedly, the development of a worthy iris of flaring, open form has been incidental to other objectives, but some recent examples can still serve to show the potential. There are challenges to any hybridizer intent on developing improved Louisianas with an open, flaring form. For all the beauty of wild irises, they exhibit some undesirable traits, particularly poor substance. A wild iris flower will not last nearly as long in the garden as most of the modern hybrids. 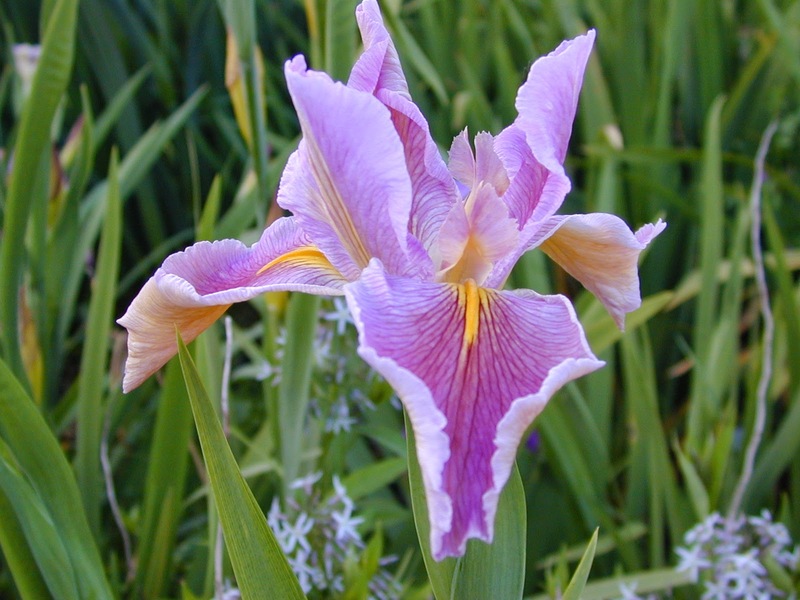 It will be necessary to address more characteristics than just flower shape if the open, flaring form is to become and remain a popular option among Louisiana iris lovers. 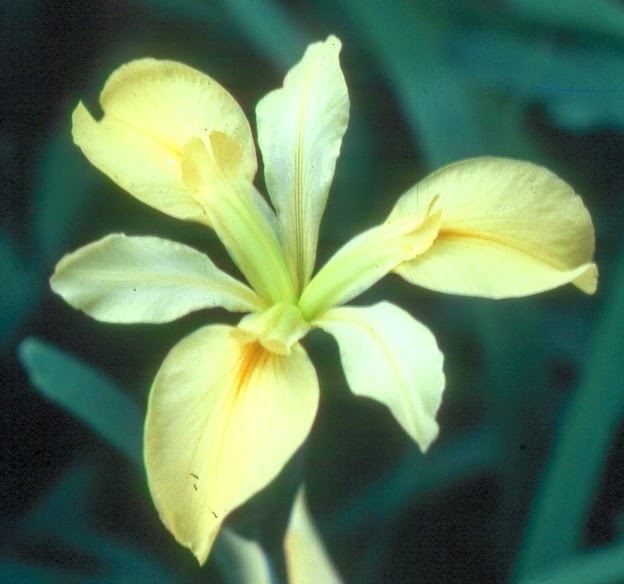 Louisiana irises have been seriously hybridized for a little over a half century and, given the changes wrought, one can only imagine (and perhaps a little bit fear) what the future might bring. The genetic potential apparently exists to shape these flowers into forms unimaginable today. In another fifty years, perhaps they could all look like tropical hibiscus if hybridizers put their tweezers to the task. Hopefully not. An open flower will present fewer square inches of color and may not look as impressive as an overlapping and frilly one when printed on a page or projected on a screen. The true test will be in the garden where poise and grace may get more credit. Gardeners most value the images they see live in the landscape. 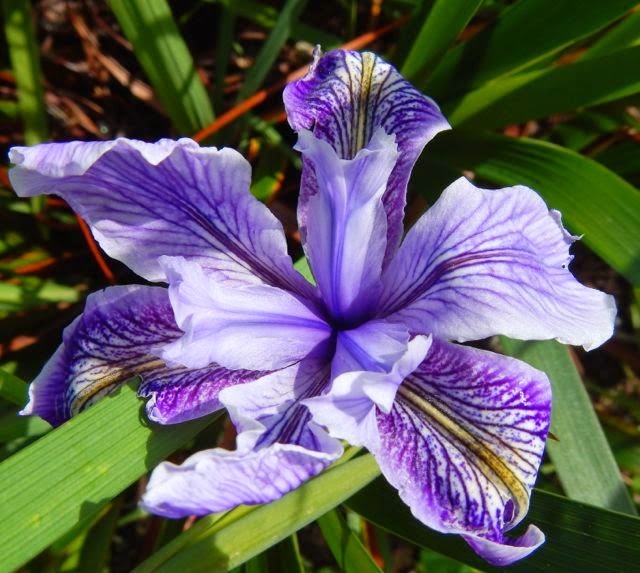 I am confident that graceful Louisiana irises can fill many a bed if we maintain their connection to the natural world..
One of my favorite types of iris is hardly known to the general gardening public: arilbreds. These striking plants are deserving of much more attention. What is an arilbred? 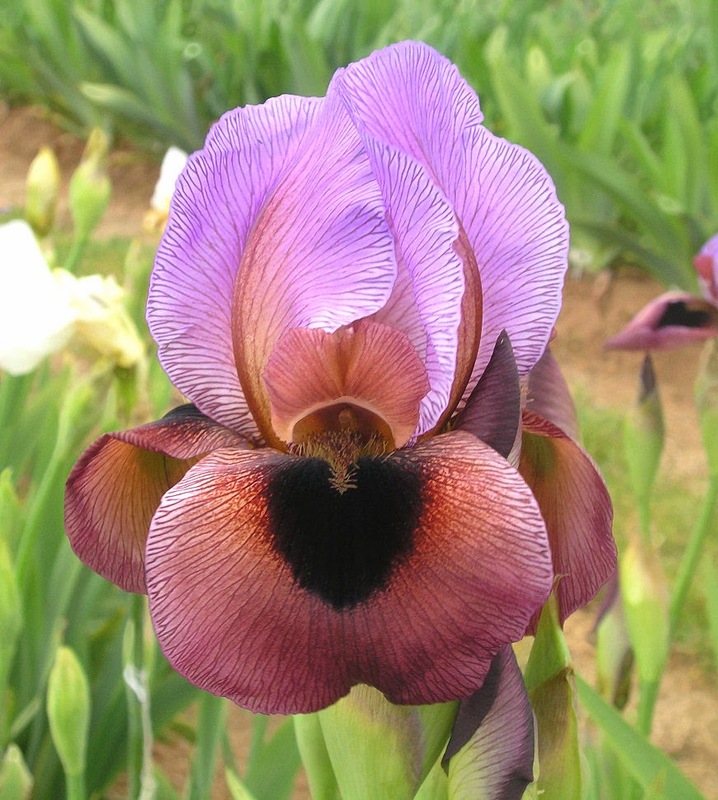 The term aril applies to two groups of irises: the oncocyclus from the Middle East, and the Regelias from central Asia. (The word "aril" is a term for the prominent white color seen on the seeds of these types of iris.) 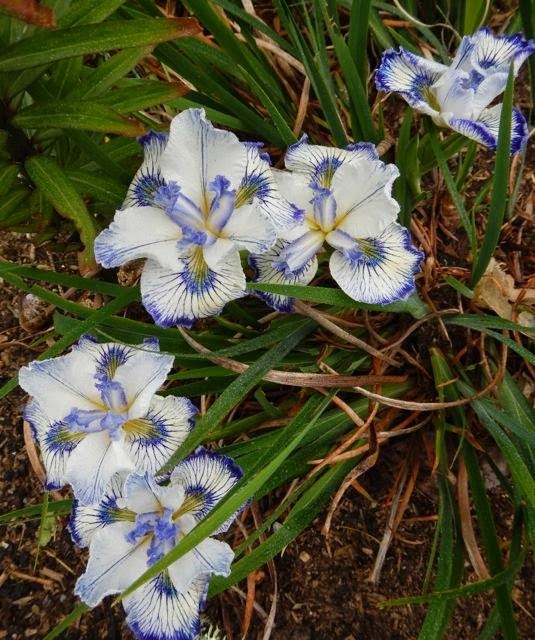 These aril irises, although some of the most spectacular flowers in the genus Iris, often proved difficult to propagate and maintain in northern Europe or the US. Arilbred irises are the result of crossing these aril irises with the more familiar bearded irises. 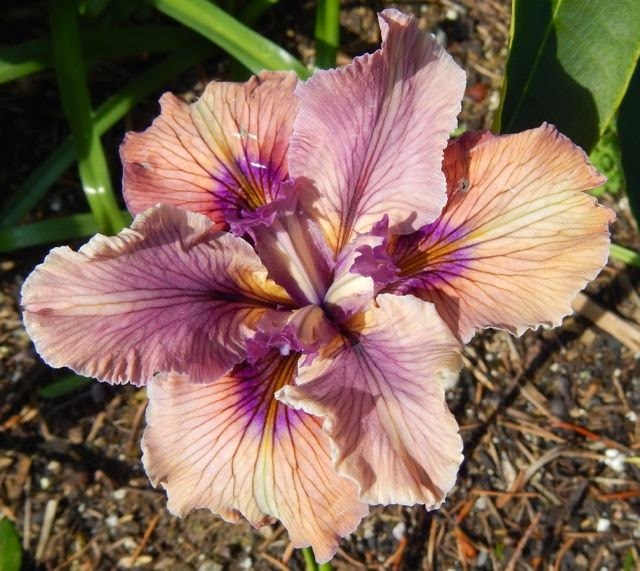 Many earlier breeders making these kinds of crosses were dreaming of flowers like those of the aril irises on plants that were as easy to grow as bearded irises. Today, this dream has largely become reality. Along the way, the endless gene combinations gave rise to a huge variety of flower types not even imagined before. 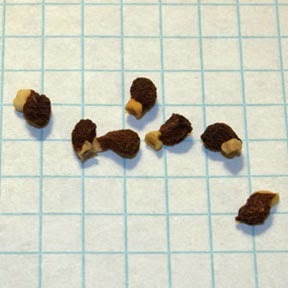 Seeds of an oncocyclus iris. Note the fleshy white collar or "aril", from which aril irises take their name. 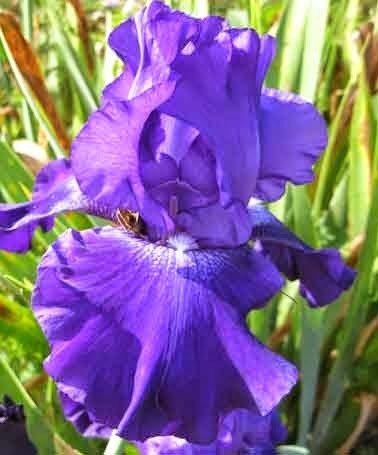 Arilbred irises come in so many different colors, patterns, and forms that it is unwise to generalize about their appearance. Many, however, have large, globular blooms, a dark signal spot below the beard, and intricate veining. 'Oyez' (White, 1938). Note the intricate veining. 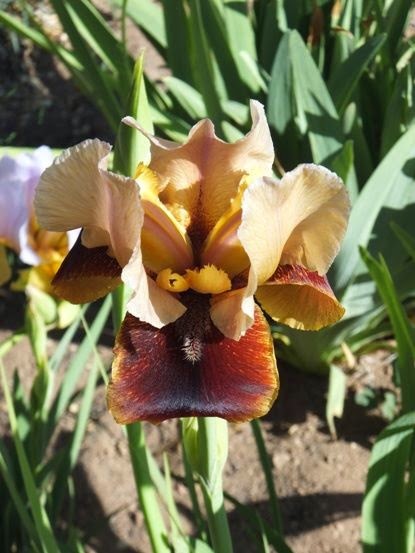 Arilbred irises grow extremely well in the western US and similar climates. They prefer conditions that are on the dry side during the heat of summer and the cold of winter, although they are not desert plants and will thrive on ample irrigation during the spring and autumn. 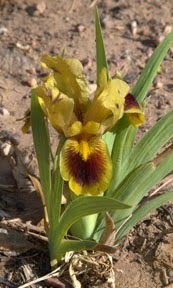 In the desert southwest of the US, arilbreds often perform better than tall bearded irises, growing more rapidly and blooming more reliably. Growers in wetter climates, such as the eastern US, often find them more challenging to grow, although many are successful with them nonetheless. If you live in a wetter area, I recommend giving your arilbreds a particularly sunny spot with good air circulation and good drainage. 'Aladdin's Gem' (Thoolen, 2002). One of the smallest arilbreds. Arilbreds come in all sizes, from tall-bearded size to dwarfs only a few inches high. 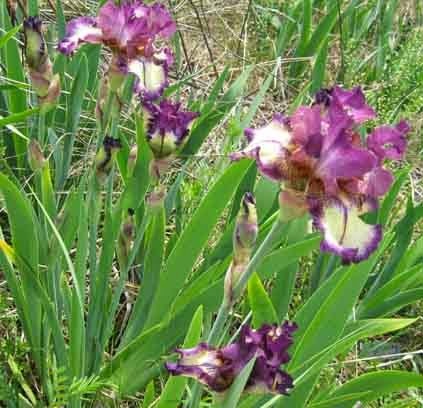 This is because all different types of bearded irises (tall, median, and dwarf) have been used to breed them, and also because the aril species themselves come in a wide range of sizes. Most arilbreds bloom earlier than the TBs, overlapping the standard dwarf bearded (SDB) and intermediate bearded (IB) bloom seasons. They do not have the branching and bud count seen on TBs: a single short branch and 3 to 4 buds is typical of many arilbreds. They make up for it with individual flowers that are showy and spectacular, and by often producing many stalks, even on a young clump. 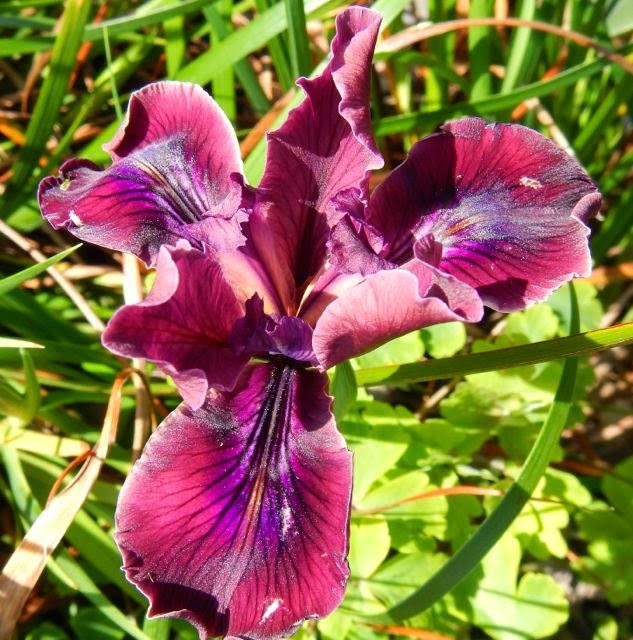 Have you tried arilbred irises in your garden? How do they like your climate? 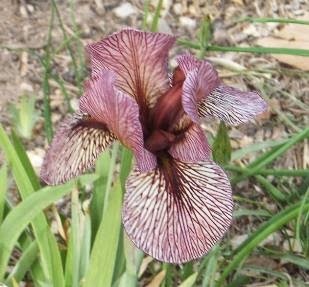 Here in my zone 6b garden, it is time to consider making new reblooming iris crosses. Rebloomers are great for producing splashes of color in the summer and fall, but the breeding is best done in the spring, since summer can be too hot and fall pods often are frost damaged. Reblooming irises usually bloom during the first week of spring iris season. Sometimes these early blooms will look fine, but will not produce any pods, since the early frost can wipe out the pollen. Be patient. The pollen will return to normal in a few days. 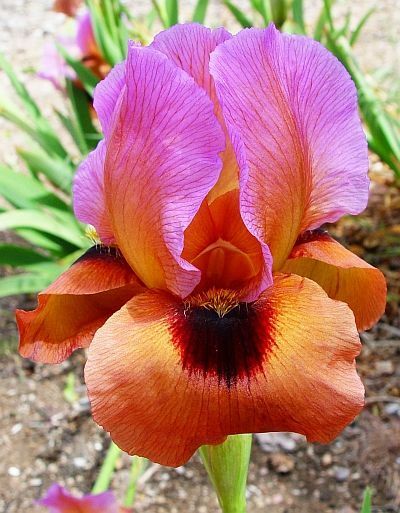 In all crosses, including rebloom crosses, always use the healthiest and strongest irises available. My friend in California has a full bed of irises that bloom all summer. Why won't those irises rebloom for me here in zone 6? It's both easier & harder than it might sound. The experts tell us they .don't have the genes needed to bloom in zone 6, most years. Weather is definitely a factor, since some of these will rebloom occasionally, when the weather is mild. I read through about ten of my old rebloom reports. Keep in mind that there hasn't been a lot of work on rebloomers for our zones or area in the past twenty years. In the twelve years I've been at my current location, we've had a couple of mild summers, and here is a list of irises that summer bloomed for me during that time: 'Pure As Gold,' 'October Sky,' 'Lord of Rings,' 'Violet Miracle,' 'Feed Back,' 'Immortality,' 'Pink Attraction,' 'Again and Again,' 'Lunar Whitewash,' 'Over and Over,' 'All Revved Up,' 'Echo Location,' 'Returning Chameleon,' 'Cool Character,' ''Summer Honey 'and 'Summer Radiance.' Most of these are fairly old when it comes to irises. When we have a mild summer, with temperatures primarily in the high eighties and low nineties, we can expect a little bloom through out the summer. 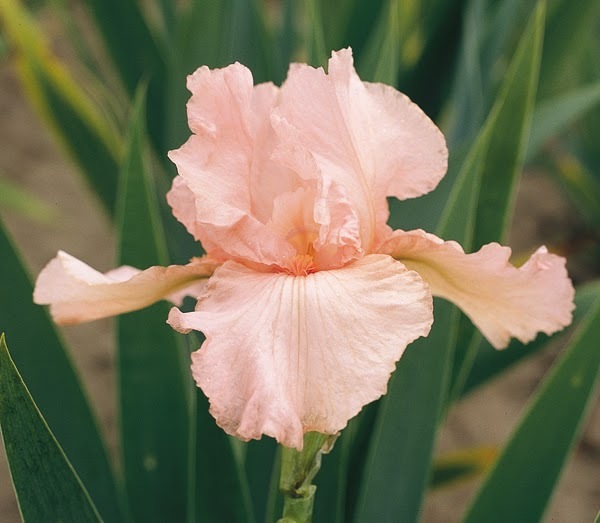 'Pink Attraction'' (E. Hall 1988) photo from Schreiner's website. Due to their genes, all rebloomers are not equal. 'Pink Attraction' likes to be moved every two years, in order to rebloom well, and does not create rebloom children in my zone 6 garden. Two of my rebloomers that can bloom in the summer and also create a lot of reblooming children, are 'All Revved Up' and 'Star Gate.' When combined with other rebloomers, they do well. Some feel that crossing the well formed irises that rebloom in California, and other temperate climates, does nothing to help us in the search for better form in the colder regions. 'Echo Location' is a very good rebloomer here and also produces reblooming children. 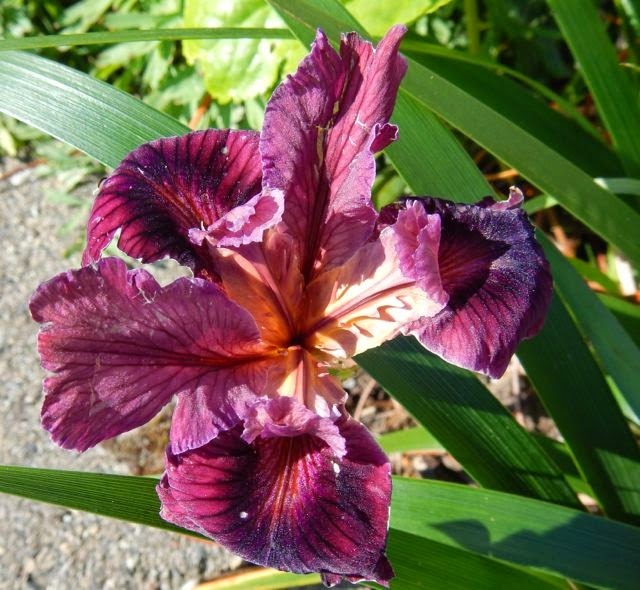 It might be a good iris to use toward breeding reds, since it has a lot of red blood lines from the Gibson side. These three, are all good for breeding reblooming plicatas. Even though it doesn't looik plicata, 'Star Gate' has a lot of plicata blood and does breed some plicata. 'Star Gate' and 'Echo Location' are both examples of hidden plicatas. Neither is a noticable plicata. I hope to produce a good red on yellow plicata.with rebloom. There are three possible bloom seasons for rebloomers:spring, summer, and fall. 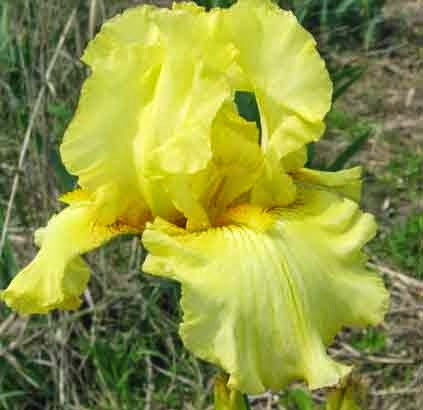 Some of us in the colder, roller coast zones have started working on summer rebloomers, giving us a better chance of seeing iris bloom during the years we have difficult spring and fall weather. Others don't want summer bloom for a variety of reasons. 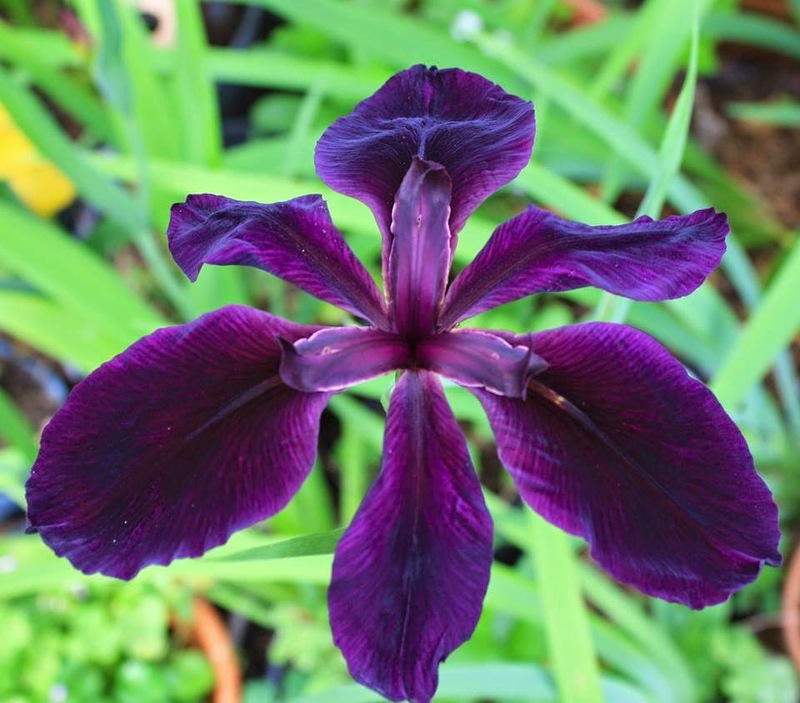 I'm not going to tell you how to create the best iris that both reblooms and meets all of the characteristics the American Iris Society requires for a spring bloomer. If I knew how to do this, I would have done it already! I've come close but no brass ring! Crossing my plicata children onto my self children created 'Summer Honey.' Several others from the cross, including some reddish seedlings , did rebloom. I've been really impressed with the stalks still standing on 'Summer Honey' once the frost hit in mid october. What cross would you make this spring in an attempt to promote rebloom in the colder zones? 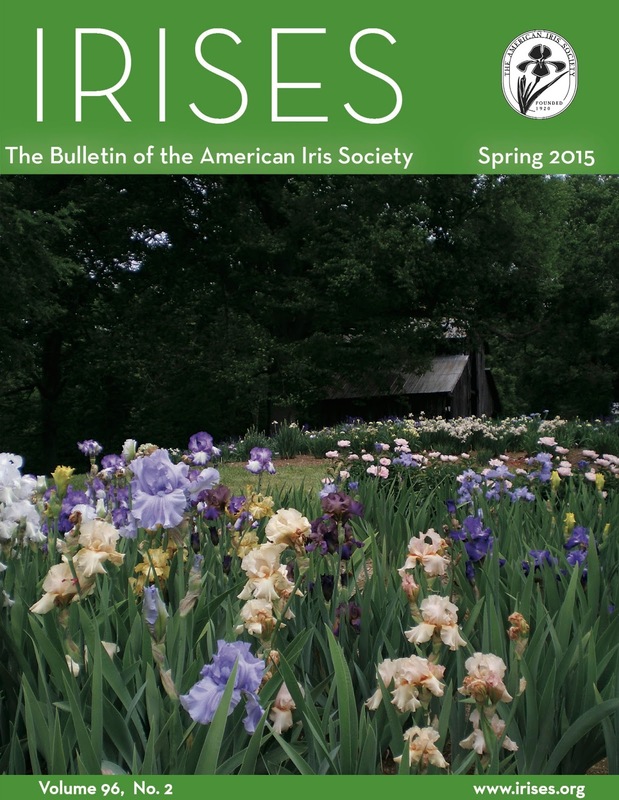 Hot off the presses, here's the Spring Edition of IRISES, the Bulletin of The American iris Society. On the cover, irises and more irises from The Joyce Lockatell Memorial Garden, Cosby Farm, Virginia. The Spring 2015 issue of the AIS Bulletin is now available for online viewing within the Emembers section of the AIS website. Note: to access this area you must have a current AIS Emembership. AIS Emembership is separate from the normal AIS membership. Please see the Electronic Membership Information area of the AIS website for more details. A fantastic edition, as usual, with information and articles varied for all to delight. Our AIS President Jim Morris writes an extensive opening statement that includes details about his recent trip south of the Equator -- to Australia and New Zealand. A lengthy article with lots of interesting pictures is published later in this issue in the section, Irises Down Under, Australia. Besides all the gorgeous irises from local hybridizers we have come to know and enjoy such as Blyth, Grosvernor and Taylor, I enjoyed the pictures of the Proteaceae family hybrid called Warath, and Echium candicans 'Pride of Madeira.' Gorgeous beauties. I hope Ken Walker, from Northern California is preparing a digital program because if it is as interesting as his articles in the last three editions of IRISES, I wouldn't want to miss it. 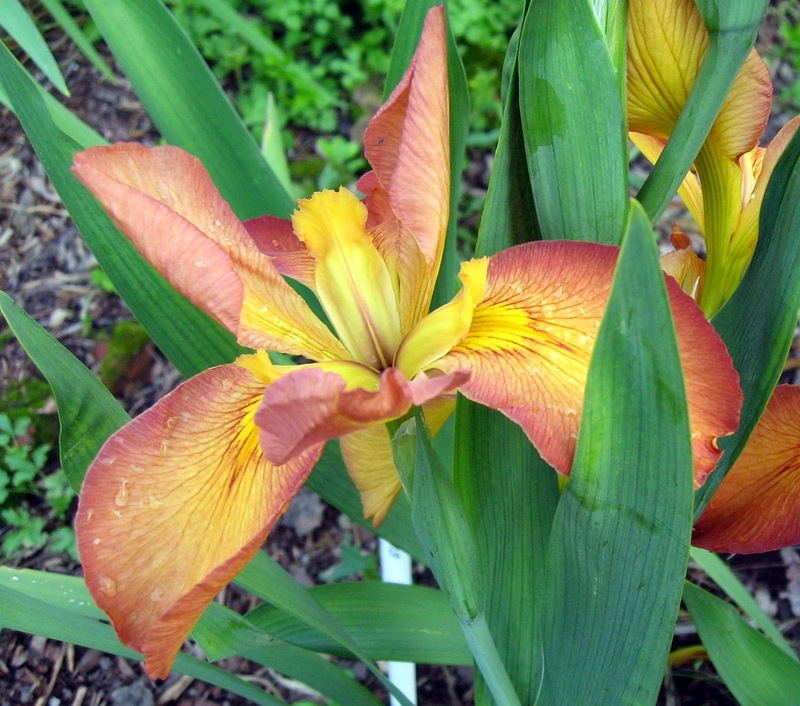 This one is Iris Parts: Diversity in the Genus, Party 3 -- Flowers, starting on page 19. It was fascinating to read starting on page 30, about the collaborative efforts of the Missouri Botanical Garden botanical staffers Kyle Cheesborough's and Jason Delaney's exploration and plant collecting in the Altai region of Southern Siberia, Russia, a UNESCO World Heritage Center. What a thrill to know that this exploration and work has been sponsored in part by the Greater Saint Louis Iris Society. 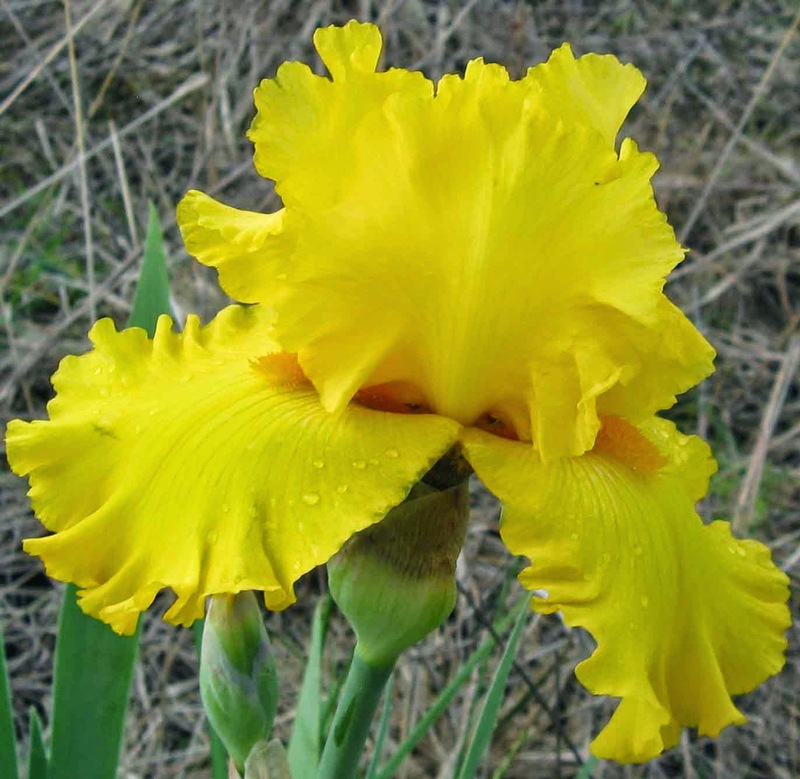 Everything you need to know about the 2015 Portland, OR National Convention of The American Iris Society, is on page 32-33, and by the way, hope to see you there. I read with much pleasure the article by Katherine Cook about the Franklin Cook's Iris Garden, and its history along with a touching biography of her dad, Franklin Cook. Yes, the same person for which the AIS convention award is named: The Franklin Cook Memorial Cup. Here's a sneak peek: To either side of the tool house, double French lilacs, mixed with singles, heavily perfumed as they can only be in a moist midwestern spring. Following the white picket fence perimeter south, to the west corner, and coming west to each side of the barbecue, were crabapples of several varieties, from white, pink, double, to deep rose, framing the center beds of iris displays. From there, my mother made jelly each year. 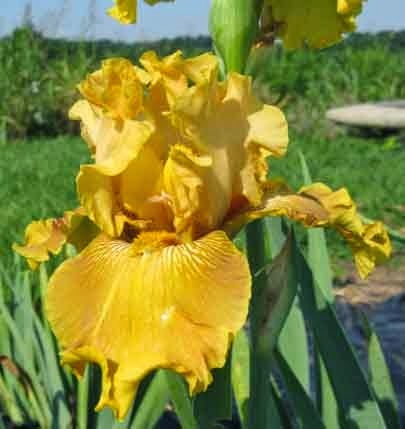 If you are interested in reblooming irises, you must read the article: Gibson Plicatas, Create Modern Rebloomers, by Mike Lockatell, on pages 40-41. There's so much to see in this edition of IRISES, either in digital or print formats. I hope you are an AIS member because that means that you will receive the print edition soon, or if you are an e-member, then that version is already available online as mentioned above. The first PCI flowers are always exciting, whether hybrids new to the garden, or seedlings that are flowering for the first time. Let the record show that something (I suspect a chipmunk) ate the bud of one of my earliest flowering new seedlings, so that 'first' flower will have to wait a year. Also, Garry Knipe's winter flowering hybrid PCI 'Premonition of Spring' flowered from mid fall right throughout winter, and is sporadically flowering even now. In this post, other new PCI flowers are featured. The grand old hybrid PCI 'Mission Santa Cruz' opened its first flowers in early April, and the deep velvet rose color reminded me again why this hybrid is so good for breeding and enjoying. PCI 'Mission Santa Cruz' is a lovely rose pink, with a velvety tone to the falls, which have dark veins and a small touch of gold. PCI 'Harry's Rootbeer' has PCI 'Mission Santa Cruz' genes, and opened about the same time. Slightly darker with wider petals, the plants are sturdy and on the tall side, perfect for a few feet back in the border. This plant is from Matilija Nursery in southern California. PCI 'Harry's Rootbeer' was developed by a southern California grower, and the toughness for hot dry conditions has translated well to the Pacific Northwest coast. Two PCI seedlings from a pod parent PCI 'Violet Blush' are being evaluated. The first flower has slightly wider petals and interesting but not outstanding color. The pedicels are long, and the flowers tend to flop. It's probably coming out soon; in a wet climate floppiness is not a good character to encourage. This seedling of pod parent PCI 'Violet Blush' has interesting purple, pink and yellow flowers, but the flowers flop over on long pedicels; the plants are sturdy, but the flower stalks are not. The other seedling from PCI 'Violet Blush' has more of a species-type flower, narrower falls, standards and style arms, but the color is nice, a mix of purple and lavender. The plant is sturdy and upright, and the flowers are held up well also. It's going to stay for a few more years. Another seedling from the same pod parent as above, this one is species-like with smaller flowers. 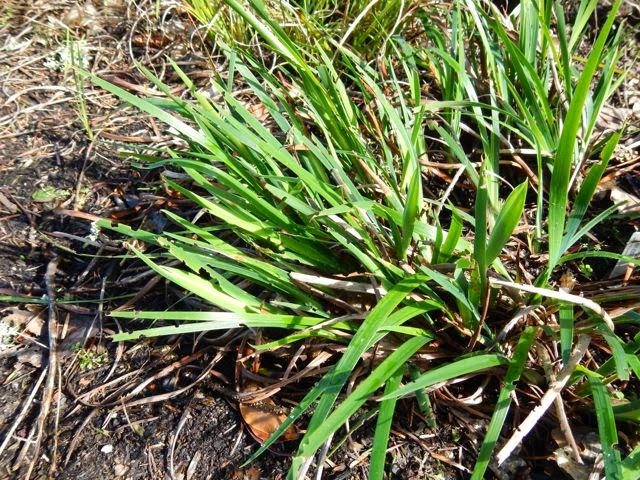 The plants are sturdy, the flowers are on strong stems and nicely upright. The plus for a windy wet climate is that the flowers wear well in the rain. Seedlings of PCI 'Santa Rosalita' are also flowering now. Rain damaged the first plant's flowers so much that it was hard to evaluate them this year. A second plant of the same seed lot was luckier to open its flowers in a drier period, and they are lovely, wide, open, held well, on a medium sized plant. A seedling of PCI 'Santa Rosalita', flowering for the first time this spring. The plant has better vigor than other siblings, and the flowers are large, ruffly, peachy-pink, and nicely complex with dark veins and a lovely purple and orange signal. It probably won't hold up in the rain, but it sure is gorgeous. 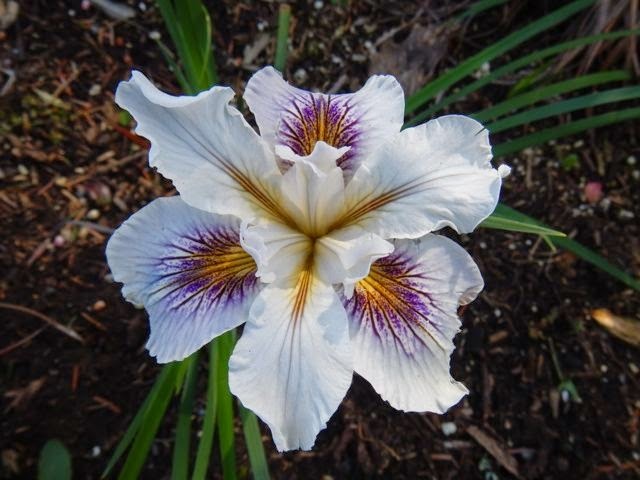 The star of my early spring irises is a hybrid from Richard Richards, who gardens in southern California and has spent decades developing truly tough PCI for hot dry climates. That toughness appears to translate well into the Pacific Northwest. This PCI opened its first flower in early April, and is definitely a keeper. Good job, Richard! Richard Richards sent me this lovely hybrid last fall. I overwintered it in the cold frame and planted it out a few weeks ago. I was very pleased to see a bud a few weeks ago, and it opened in early April. The plant is sturdy, the flower is quite lovely, and as it's raining right now, I will see tomorrow how well the flower does with precipitation. Which PCIs are blooming in your garden this month? Over the years, a variety of invertebrates and vertebrate flower-eating varmints have made their presences known in my garden. PCI 'Finger Pointing' is a lovely early flowering PCI, but fails to flower in many years due to wet windy weather. Seed set is also erratic due to vagaries of weather. 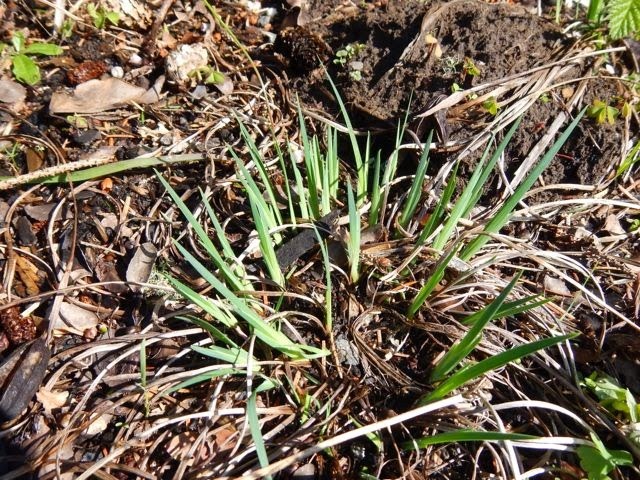 Slugs and snails normally disdain irises in general and Pacifica Iris in particular, but not when there are young, tender leaves to be had early in the year, or tasty young flower buds. 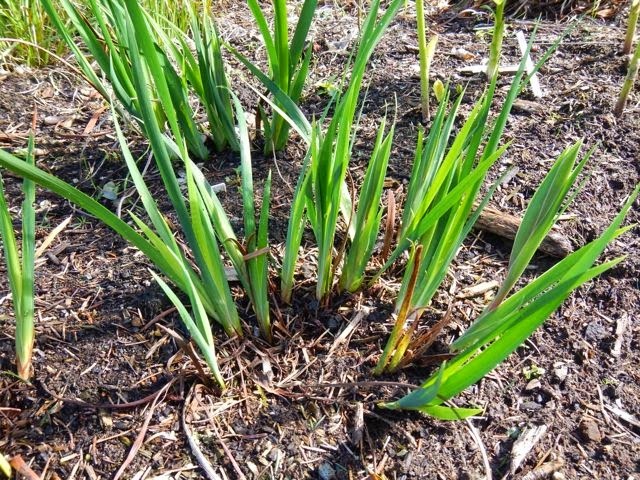 One of the better reasons to pull old leaves and winter debris from the iris beds is to reduce hiding places for slugs and snails. A tidied up PCI plant. Not shown: the five small snails and slugs that were removed with the dead leaves and winter debris. Then there are Stellar's Jays, which find germinating iris seeds and seedlings to be a delicacy. Black-tailed Deer also like Pacifica iris shoots, at least the first few mouthfuls, before they start spitting them out and leaving them alone. And then the chipmunks moved in, capable of disbudding entire flower beds in one night. It's enough to make me think about an outside cat! Right in the center of this image, the former flower bud, with the pedicle still visible between the bracts. Guilty party––a chipmunk. 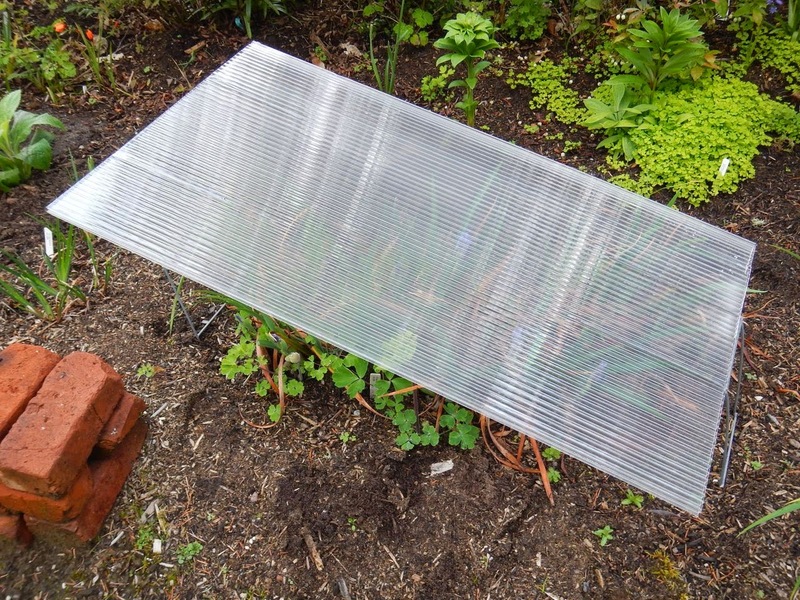 Jays and other seed eating birds drove me to use wire mesh to cover seed boxes. Once the seedlings are more than four inches tall, even the deer leave them alone, but until then these must be like alfalfa sprouts to them, young and tasty. The weather doesn't help. 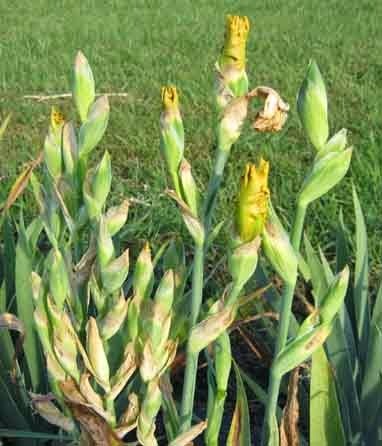 Heavy rain and hailstorms in April and May often end the flower display from many a well known hybrid Pacifica Iris. I've used temporary covers over plants so that I can at least get a few photos of flowers. But there's a maxim that if the weather is wet enough to ruin early flowers, then protecting them won't help seed set, because the bees don't like rain and hail any more than the flowers do. Rain screen deployed over a PCI plant. The flowering sequence at my latitude (46 N) is something like this: Modern PCI hybrids begin flowering in April, with the exception of PCI 'Premonition of Spring', which flowers off and on from September to April. This group continues to flower into May. In late April to May, many older Iris douglasiana selections come into flower, including PCI 'Canyon Snow' and 'Cape Ferrello'. 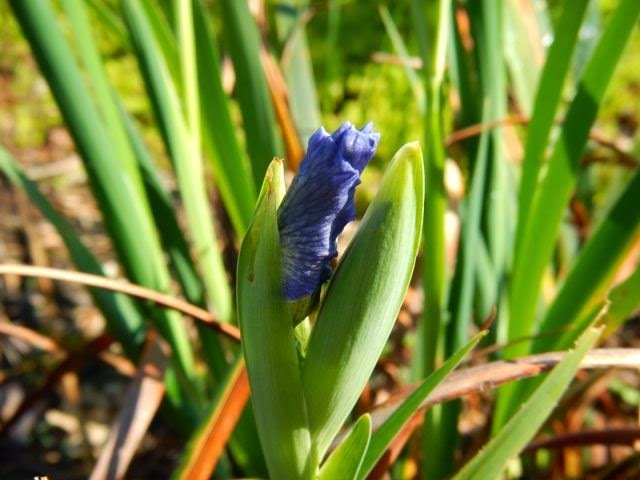 In June, species irises begin flowering, including Iris tenax, I chrysophylla and I. innominata. A patch of I. tenax x I. innominata plants regularly flower into late June, and sometimes into early July. Some dwarf I. douglasiana plants also flower in June. PCI 'Blue Plate Special' is ready to flower in early April. At the same time, Iris tenax is just getting started with new leaves. The difference is that the latter plant will flower better, and probably set more seeds, by flowering in June. In my climate, that makes a huge difference. Given a tendency lately for weather to be too wet in April, and too hot in May for good seed set, often it's the late flowering species and species crosses that do the best. I've come to treasure the durable late flowering plants, because they are more reliable than the gorgeous, early flowering hybrids. PCI 'Blue Plate Special' in bud––a beautiful sight, but will there be flowers to follow? Only Pluvius, the god of rain, knows.